In 2009, the several Bear Lake property owners contacted the Au Sable Institute, and the Michigan Department of Natural Resources with the purpose to improve and protect the lake. As a result, the Bear Lake Association- Kalkaska was formed. As property owners around Bear Lake, we all have an investment in the lake. Whether we use it for swimming, boating, fishing, or simply enjoying the view, preserving the quality of the lake is important to all of us. This information has been prepared by the Bear Lake Homeowners Association to provide homeowners with information about how to protect Bear Lake. With a surface area of 316 acres, Bear Lake is a relatively small lake. However, despite its size, the lake is deep with a maximum depth of 60 feet and a mean average depth of 35 feet. The shoreline of Bear Lake is over 3.1 miles. It has no inlets or outlets and is managed as a two story lake. Two-story lakes are those that have shallow water habitat for warm and cool water game fish such as bass and pan fish, along with deep cold water habitat suitable for trout. Only 15 % of Bear Lake is shallower than 5 feet, while 60 % of the lake is deeper than 30 feet. Bear Lake is fairly round in shape, but it does have one small, shallow, connected pond of several acres in size that is only three or four feet at its deepest spot referred to as Eleanor Bay. The substrates in Bear Lake are predominantly marl and sand, although there are a few areas with organic muck. There is little aquatic vegetation in the lake, and an overall lack of cover. There are a few logs and stumps, and artificial cover structures were reportedly installed back in the 1940s. The shoreline of Bear Lake is heavily developed, as there are roughly 150 private residences on Bear Lake. The county surrounding Bear Lake is hilly and mostly forested, with predominantly sandy soils. Public access to Bear Lake is obtained at the MDNR access site on the southeast corner of the lake. The access site has a paved launch ramp and parking for six or so vehicles with trailers. The land area surrounding a lake that drains to the lake is called a watershed or drainage basin. A watershed boundary is determined by examining a topographical map that shows the area that drains to the lake. The Bear Lake watershed is approximately ?1400 acres in area, a land area about 4 1/2 times larger than the lake itself. Much of the watershed is forest. However, most of the land immediately adjacent to the lake has been developed.Forest land and wetland in the watershed are beneficial in that they contribute very little runoff to the lake. Wetlands in particular perform several important ecological functions. They store floodwaters, provide habitat for fish and wildlife, and help filter storm water. Preservation of wetland in the Bear Lake watershed is vital to the protection of the lake.Currently, the homes and cottages around Bear Lake are served by on-site septic systems. 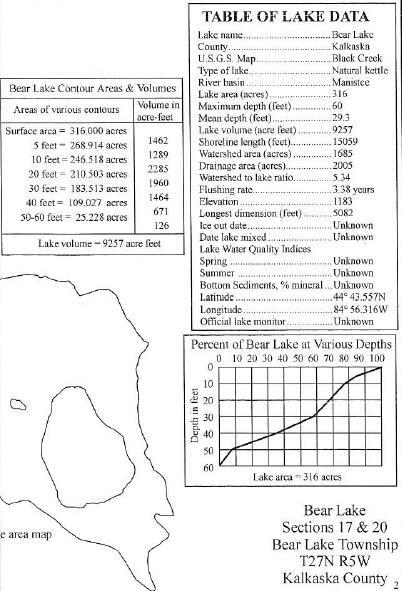 Soils mapping conducted by the U.S. Department of Agriculture Soil Conversation Service indicates that the soils surrounding Bear Lake are composed largely of Rubicon, Croswell,and Aux-Gres Sands with some Aux-Roscommon. These soils generally have a limitation for on site septic systems due to either poor filtering due to rapid infiltration or steep slopes and high water table. Problems associated with malfunctioning septic systems can be expected to increase as more homes around Bear Lake are converted from seasonal to year-round use. Eventually, the limited ability of area soils to retain pollutants will be exceeded. Until community sewer service is available proper operation and maintenance of septic systems will be required to protect the lake.Most of the development in the Bear Lake watershed is concentrated near the lake. As a result, the shore lands around Bear Lake have changed. Natural areas that allowed rain waters to infiltrate have been replaced by roof tops, roads, driveways, and other hard surfaces. Now, rather than infiltrating, storm water runs off these hard surfaces, often carrying fertilizer, oil, and other pollutants to the lake. Shore land runoff can directly impact areas near shore and cause unsightly algae growth. Reducing pollution inputs from the watershed is essential to protecting the quality of Bear Lake over the long term. Phosphorus is the nutrient that most often stimulates excessive growth of aquatic plants and algae, leading to a number of problems collectively known as eutrophication. By measuring phosphorus levels, it is possible to gauge the overall health of the lake. Lakes with a phosphorus concentration of 20 parts per billion or greater are considered to be eutrophic. Phosphorus levels in Bear Lake are below the eutrophic threshold level. The average level from 1997 to 2006 have been 6.2 parts rep billion. The results for 2007 and 2008 were not reported.Chlorophyll-a is a pigment that imparts the green color to plants and algae. A rough estimate of the quantity of algae present in the water column can be made by measuring the amount of chlorophyll-a in the water column. A chlorophyll-a concentration greater than 6 parts per billion is considered characteristic of a eutrophic condition. Chlorophyll-a a levels measured in Bear Lake are consistently below eutrophic threshold concentration indicating algae growth in the open waters of the lake is moderate. A Secchi disk is a round ,black and white ,8 inch disk that is used to estimate water clarity. Eutrophic lakes have a Secchi transparency of less than 7. 5 feet. Generally, it has been found that plants can grow to a depth of about twice the Secchi disk transparency. 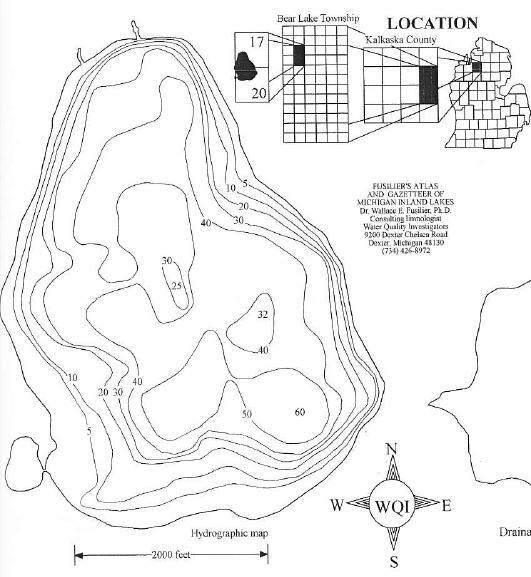 In Bear Lake, Secchi reading have averaged about 25 feet indicating that sunlight penetration is sufficient to support aquatic plant growth over some the bottom of Bear Lake. Bear Lake maintains a prized fishery. In a survey performed in 2005 by the Michigan Department of Natural Resources (MDNR) 13 different fish species were found in the lake. Game fish in the lake includes small mouth bass, rock bass, largemouth bass, yellow perch, brown trout, pumpkinseed sunfish, white suckers and rainbow trout.Bear Lake supports a healthy warm-water and cool-water fishery. The lake also supports cold-water fish- both rainbow trout and brown trout.Fishing is a popular pastime in Bear Lake and trout are one of the most sought-after game fish. Bear Lake has been stocked with trout on a periodic basis since the early 1900s. The most extensive trout stocking was performed in 1937. The current prescription calls for 15,000 Wild Rose strain brown trout and 5,000 Eagle Lake strain rainbow trout. Bear Lake is classified as a Type B lake under the new trout regulations, which went into effect in April 2000. Type B lake regulations include a year-round fishing season, a minimum size limit of 12 inches for brown trout and a daily bag limit of five trout.The Bear Lake brown trout stocking is popular with anglers and should be continued. The supplemental rainbow trout stocking program also seems to be successful. This will enhance the fishery in the lake and add some diversity to the sport catch. Since white suckers still represent a large proportion of the biomass in Bear Lake, manual removals should continue to be done periodically to lower white sucker population. The next manual sucker removal is scheduled for 2010, depending upon staff and personnel resources. White suckers were netted for 3 days – April 21, 22, and 23, 2010 – it was estimated that 800 to 1,000 suckers were removed from the lake and given away to local residences. It was noted that there were a number of suckers in the 5 lb range. Suckers are removed from lakes as they feed on beds of other fish in the lake. Bear Lake was stocked with 5,700 rainbow trout on 4/16/10, and will be stocked with approximately 16,000 brown trout on Monday. For the next five years, Bear Lake is going to be part of a study in which we compare the performance of two different types of brown trout. We will be stocking equal numbers (about 8,000) of both Wild Rose strain and Sturgeon River strain brown trout. They will be marked with different fin clips. The Sturgeon River strain brown trout will be marked with a left ventral clip, while the Wild Rose strain brown trout will be marked with a right ventral clip. We will be doing some fish sampling in the fall to check on the survival of both strains.